Busan is one of my favorite cities in Korea. For those of you who might not be familiar with the place, I’ve compiled a list, below, to explain to you why Busan is awesome. This was actually the first thing that came to mind when I was listing all the reasons why I love Busan. Even if you’re not a big fan of the spicy food that people often associate with Korean dishes, Busan has much to offer. There’s fresh and reasonably-priced seafood. 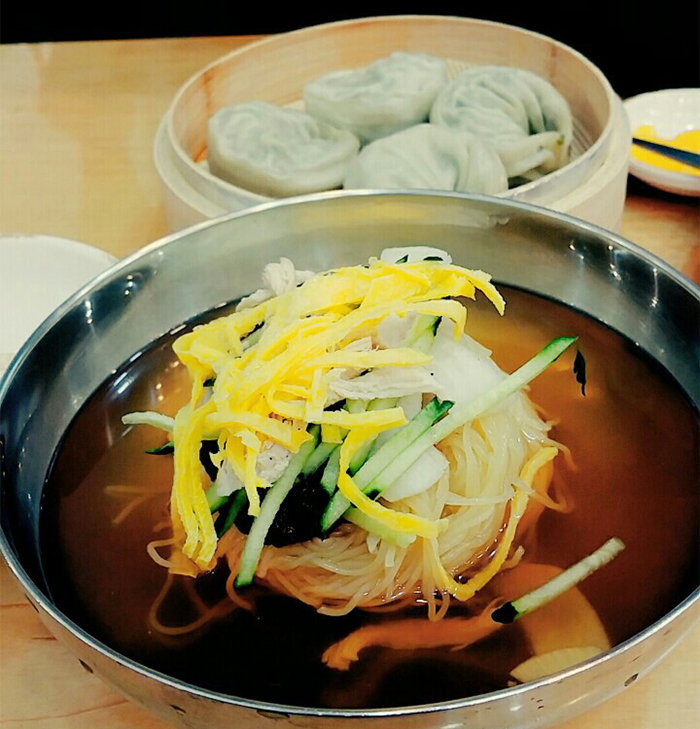 Among many other dishes, Busan is known for its fishcake called eomook (어묵). Be sure to try it! There are different kinds of noodles, too. There’s a particular kind called milmyon (밀면) for which Busan is especially famous for. There’s a stew or a soup made from pork called kuk-bab (돼지국밥), there are sweets like hotteok with seeds (씨앗호떡), and the list goes on and on! You should definitely check out some night markets for cheap and delicious street food, upon which I will elaborate later. Milmyon with dumplings is a Busan specialty. 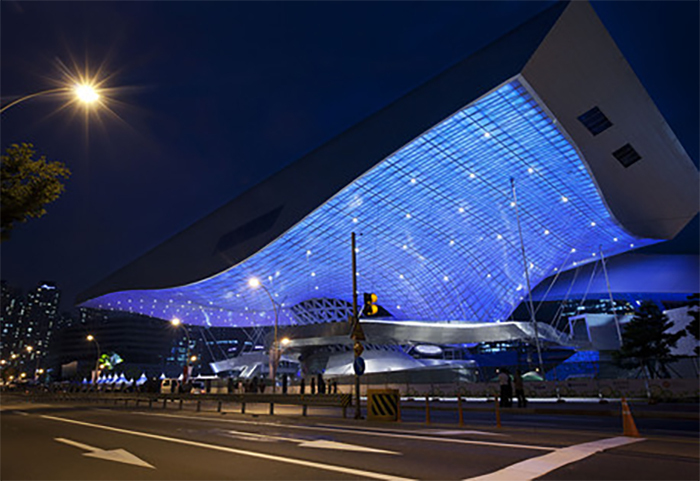 You can easily travel to Busan from the major cities of Korea, since flights, KTX high-speed trains, normal trains and express buses run often and regularly. Busan Station has many tourist spots nearby, so you can just put your heavy bags in a locker at the station and explore. Also, from Gimhae International Airport, you can use the subway and monorail system, a cheap and efficient way to get downtown. 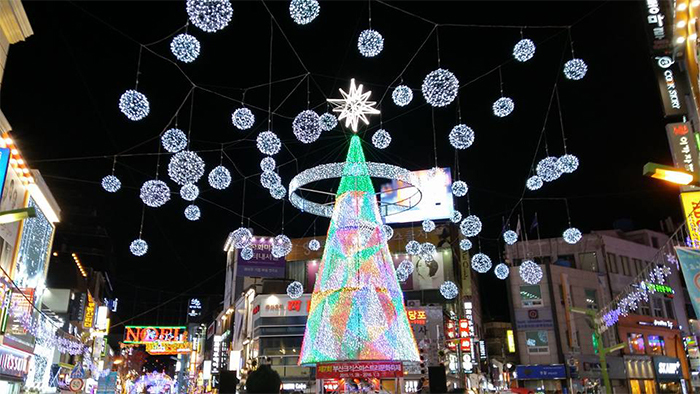 For example, Seomyon, which is said to be the liveliest part of Busan, is less than 30 minutes from the airport. In case you’re interested, Busan is also close to China, Japan and Russia, which are all reachable by ferry. If you plan well ahead, you might be able to travel to those countries even on a low budget. Don’t forget that we girls need to shop, no matter where we are, right? Well, welcome to Busan. The Shinsege Department Store at Centum City is one of the biggest department stores in the world, last time I checked, and it has a Guinness World Records certificate there to prove it. 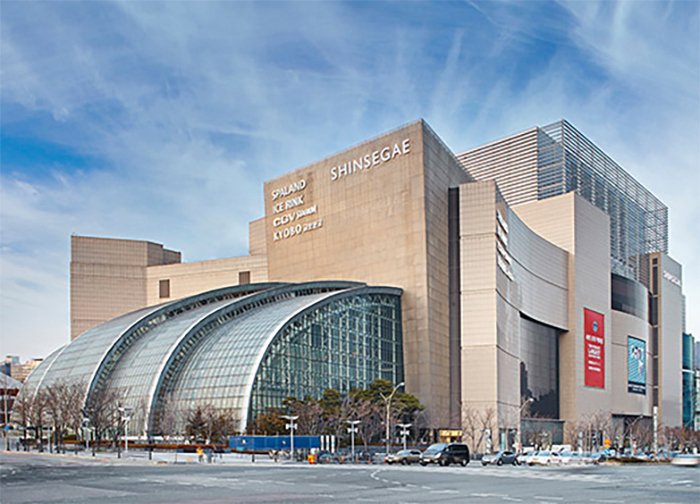 The Shingsege Department Store at Centum City in Busan is one of the biggest shopping malls in the world (Photo: shinsegae.com). 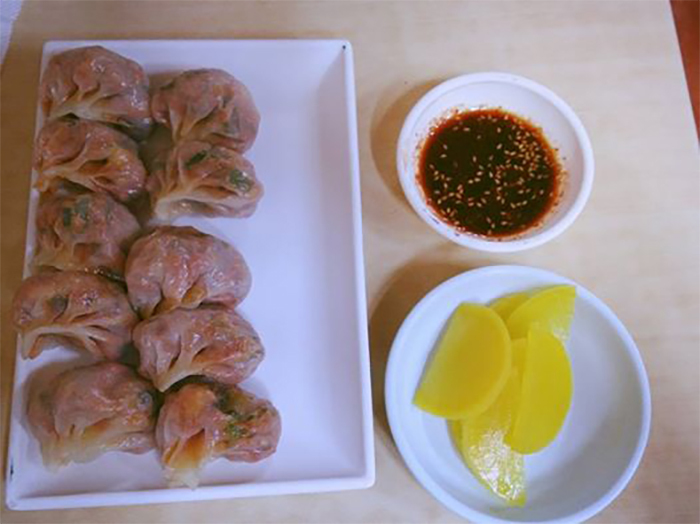 Kimchi dumplings can be found in the Gaegeum Traditional Market. 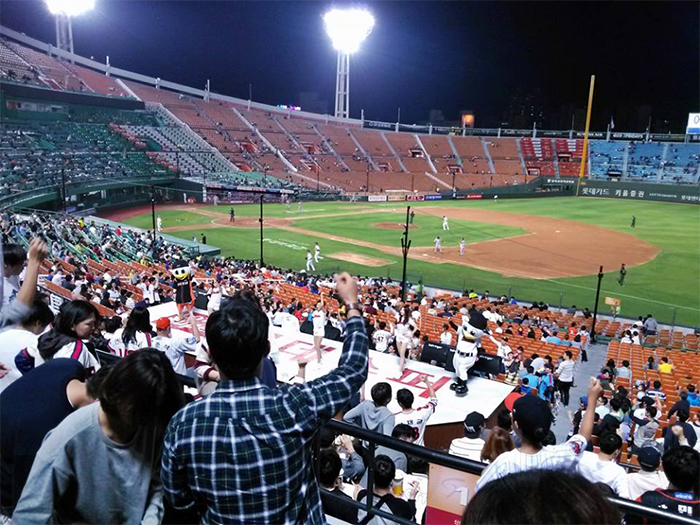 Now, before you say, “I’m not a fan of baseball, or sports, for that matter,” you don’t have to be a fan to enjoy a baseball game in Busan. You don’t even have to know the rules. Just standing at the Sajik Baseball Stadium will be a unique experience for you. After seeing people around you chanting, singing and dancing in unison, you won’t be able to sit still. Chicken and beer, or pizza and coke, depending on your preference, just seem more delicious at a baseball game and in that atmosphere. The Lotte Giants, the team that represents the city of Busan, is particularly well-known for its passionate fans. This impressive fandom has been featured in numerous publications abroad, such as at the BBC. When you’re in Busan, make sure you head to Sajik Stadium. It will surely be an unforgettable night of your trip. Oops. This should’ve been at the top of the list, right? Well, in my defense, these reasons are in no particular order. Nonetheless, what would Busan be without all its beautiful beaches, crowded with thousands of people every summer, right? Haewoondae (해운대) is quite something in July and August when school’s out for the kids and when many corporations and offices give summer vacation at around the same time. Consequently, huge crowds flock to the beaches in Busan during those months. If you actually want to see the water, not people after people, I recommend Songjeong Beach (송정해수욕장). It’s relatively unknown among non-Koreans, but in my opinion is more relaxing and beautiful than Haewoondae or Kwanganri (광안리). 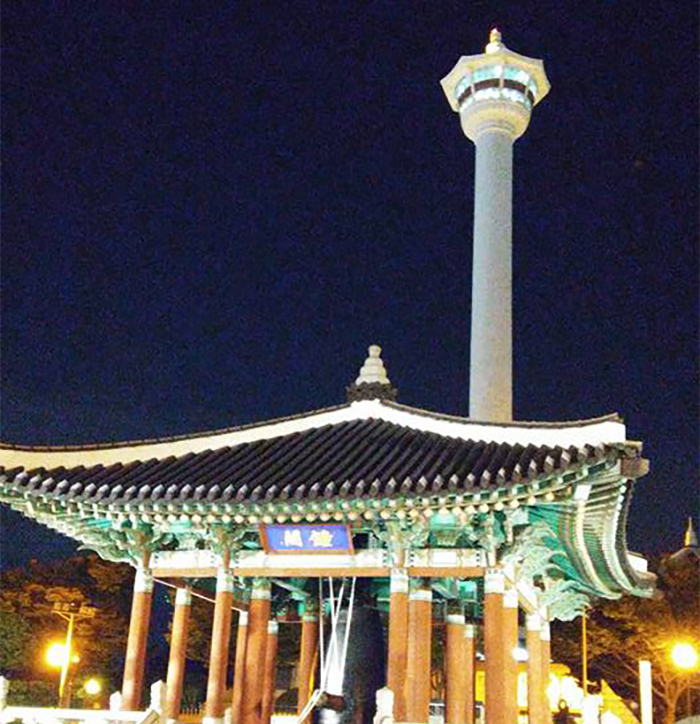 If you really want to visit Haewoondae, I would advise that you visit at night to catch a glimpse of its great night view. It kind of reminded me of Hong Kong. The Bay 101 at Haewoondae is beautiful at night. I was on a boat, so the photo is a bit blurry. 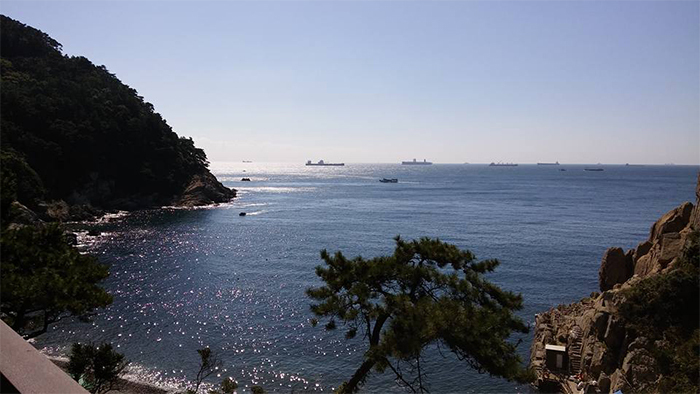 Busan also has many hiking trails and walking paths overlooking seawater, like the Taejongdae 태종대. If you enjoy hiking, you can choose from different trails that vary by distance, or just take a shuttle that goes around the pathways. The sea can be from atop Taejongdae. In case you didn’t know it, Busan hosts an annual international film festival called the Busan International Film Festival (BIFF). Every fall, the city is filled with film lovers, directors, actors and actresses from all around the world. Busan also has been a setting of countless major Korean movies, such as “Friend” (2001) (“Chingoo,” “친구”), “Tidal Wave” (2009) (“Haeundae,” “해운대”) and “Ode to My Father” (2014) (“Gukjae-shijang,” “국제시장”), to name but a few. Perhaps for this reason, many universities in Busan are educating tomorrow’s leaders of the Korean film industry. If you’re lucky, you might run into a few movie celebrities in Busan, as my friends have. The BIFF’s main venue is a sight to see (Photo: blog.wsj.com). Compared to Seoul and other big Korean cities, Busan has a high density of elderly citizens. When you use the subway or bus, chances are they’re going to start talking to you, even asking a few personal questions. “Where are you from?” “How old are you?” Sometimes they even hand out candies. I was told that people in Busan seem a bit blunt or offhanded, but maybe this has to do with their particular Busan accent, which may come off a little strong. However, I can say that during my five-month stay in Busan, I met one of the most genuinely nicest people, and I’m sure you will feel the same way. Try to interact with the locals at busy traditional markets and see how they live. You will see what I am saying. Here are some other places I recommend, with photos. 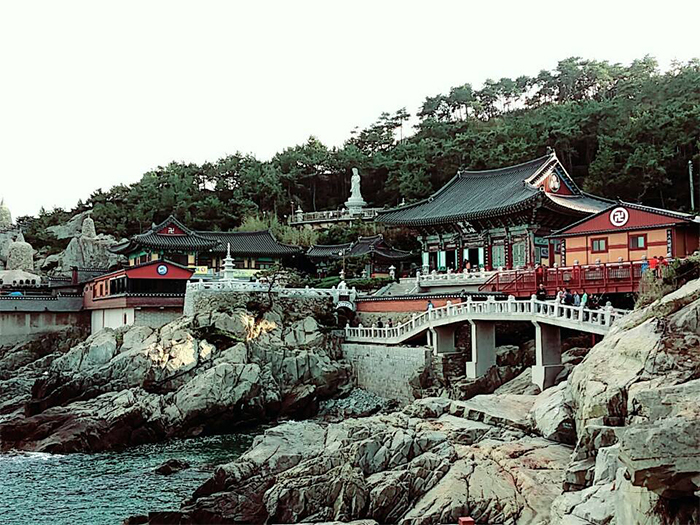 The Haedong Yonggungsa Temple (해동용궁사) is right on top of the waves. The Busan Tower is most beautiful at night. Nopo-dong (노포동) is a must-see neighborhood of Busan. 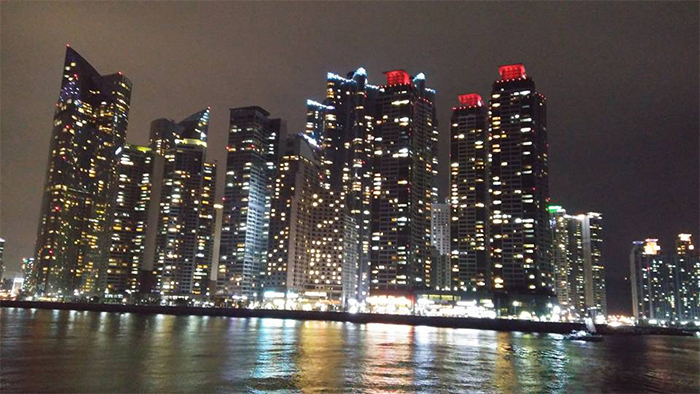 There are so many more things that I love about Busan, but I’ll wrap up my post for now. For those of you who’ve been to Busan, what do you think? What’s the first thing that comes to your mind when you think of Busan?